Great job on the PR girly! Woo hoo!!! Great race report and awesome PR! Good luck with marathon training! Great job--you dropped some serious time! Congrats on getting PR's at each 10K you race! Sounds like you had a great run! Can't wait to hear how the marathon goes! Congrats on your PR. And that picture with your girls sleeping - precious. That's awesome!!! So glad mom and dad could be there with you. Can't wait to see you guys! Your girls are getting so big! Congrats on your PR! Sounds like a great day! Great job on the PR. Sounds like a perfect race! Love the race report. Congrats on the PR! Sweet! Great photos! Have fun training your last few weeks! Congratulations on the PR! Way to rock it! The weather looks gorgeous there. Way to go on your PR!!! Wow, great job! Congrats on the big PR!!! Great job! WTG on the PR! Wow! I'm really behind on the blog front! Can't believe I didn't comment here yet. 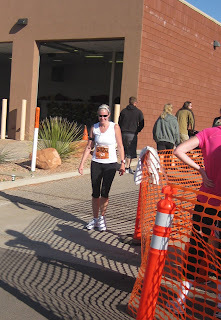 How great to run your 3rd 10k almost 30 sec/mile faster than your last one! That's killing it! Congrats!